Always start with the Tulips &Tea label in the center of your tummy. The fabric should sit very snug around your own body before you put your baby into the wrap. The fabric should stretch tightly around your little one. Complete the entire wrap before inserting your baby. Your Tulips & Tea Baby Wrap Carrier is knitted from a durable cotton mixture. This is a blended material, but the largest percentage is Cotton. Cotton washes easily in any washing machine with cold water and soap. Cotton is known to shrink easily – rather hang out to dry and not tumble dry. Cotton can be ironed, but it is not necessary to iron you baby wrap. Do not iron over the leather label. Do not iron over stains, as it will make it permanent. Find the center of the wrap. Place the label in the middle of your tummy at the center point. Take the two long pieces of fabric either side of the label in each hand and wrap it around your body towards the back. Cross the fabric in the center of your back. Tuck the two long hanging pieces underneath the section around your waist. Pull the two hanging pieces tighter for the section around your waist to rise. Cross the two hanging pieces over. Take the two crossed over hanging pieces around your waist to the back. According to your size and own preference, either tie the two pieces at the back or bring it around to the front and tie in the front or on your hip. 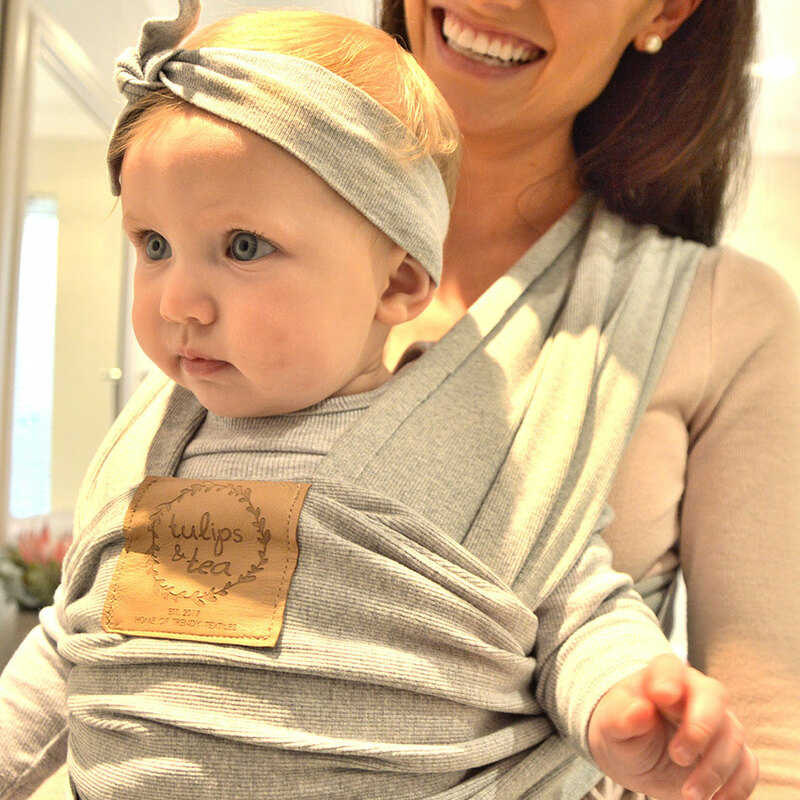 This wrap style is not advised for new born baby’s, but for baby’s who has developed posture. Cross the fabric in the center of your back & bring it over each shoulder to the front. Now you should decide if your baby should be facing towards you or if your baby should be looking away from you. Pick up your baby and let him or her face the way you prefer. Put your little one’s leg through the piece of fabric closest to your body. Put the other leg through the opposite piece of fabric over your other shoulder, ensuring that the material form a “X” between your baby’s legs. Ensure the two straps are securely over the back and shoulders of your baby. Pull the label up, over your baby’s back or tummy, depending on the way they are facing. Make sure their arms and legs are out. This wrap style is ideal for new born babies. Take the two crossed over hanging pieces around your waist to the back. According to your size and own preference, either tie the two pieces at the back or bring it around to the front and tie in the front or on your hip. coming over your opposite shoulder, ensuring that the material forms a “X” between your baby’s legs. Ensure the two straps are secured over the back and shoulders of your baby. Tuck your little one’s legs in whilst pulling the label upwards to secure your baby. This wrap style is ideal for new born baby’s or newborn twins. Unwrap your Tulips & Tea baby warp carrier and find the center of the wrap. Cross the fabric in the center of your back and bring it over each shoulder to the front. Tuck the two long hanging pieces of fabric underneath the section around your waist. According to your size and own preference, either tie the two pieces at the back or bring it around to the front and tie in the front or on your hip. If you are wearing your twin, please make sure to tighten your wrap even more, than when wearing one baby. Pull the label down, out of the way. 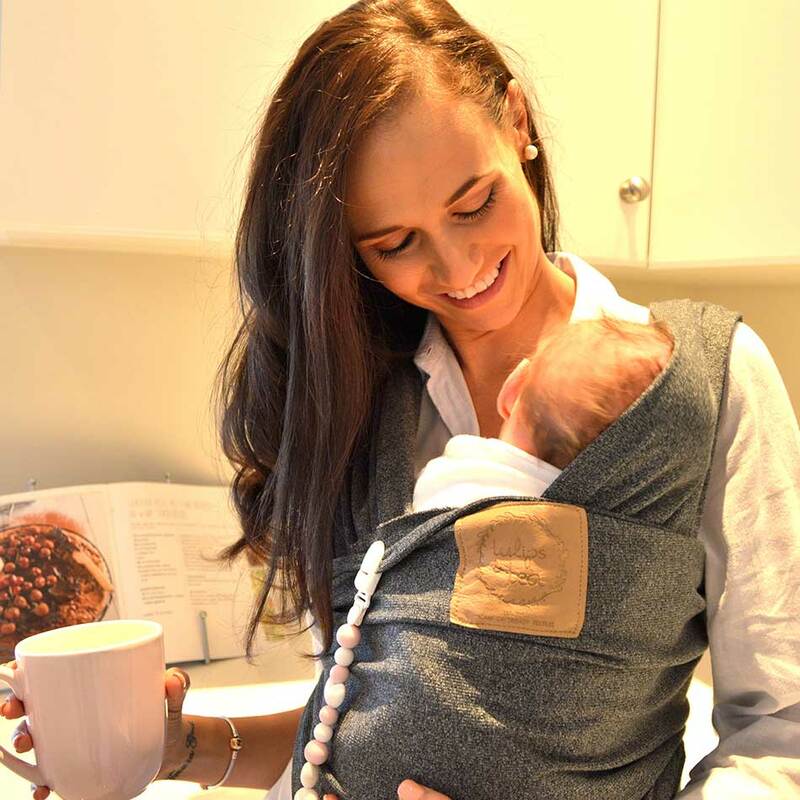 Put your baby either in the one sling against your clothing so that he or she rests comfortably or put your baby in the other sling that is not spread open against your body. (See option A and option B) If you have a twin, put each baby in a sling over each breast. Whichever option you chose, take the other sling and pull it over your baby as high up as you wish to secure your baby and protect him or her from the wind or sunlight. Please make sure that your baby can breathe easily. If you have a twin this step is not applicable to you. Lastly pull the label upwards to secure your baby.